Externalities are defined as the positive or negative consequences of economic activities on unrelated third parties. Since the causers are not directly affected by those externalities, they will not take them into account. As a result, the social cost (or benefit) of these activities is different from their individual cost (or benefit), which results in a market failure. There are different types of externalities. The definition above already suggests that they can be either positive or negative. Additionally, there is another (and maybe less familiar) distinction which should be made here: Both positive and negative externalities can arise on the production or on the consumption side. In the following paragraphs we will look at the different types of externalities in more detail. Economic activities that have positive effects on unrelated third parties are considered positive externalities. As we learned above, they may be present in the form of production or consumption externalities. Positive production externalities are positive effects that originate during the production process of a good or service. An example of this could be an orchard placed next to a beehive. In this situation both the farmer and the beekeeper benefit from each other, even though from an economic perspective neither of them has considered the other one’s needs in their decision-making. This can be illustrated by comparing social cost and social benefit based on a supply and demand diagram. In our example, individual demand (D) is equal to social benefit (SB) since there are no externalities on the consumption side. 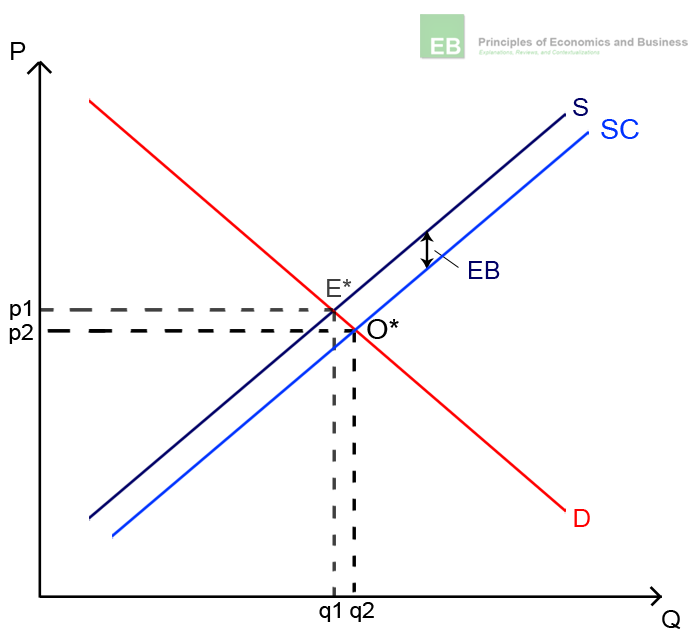 However social cost (SC) is lower than individual supply (S) because there is an external benefit (EB) that is not included in the individual supply curve. As a result, the market equilibrium (E*) is different from the optimal market situation (O*) and there is an under supply of both orchards and beehives. Positive consumption externalities are positive effects on third parties that originate from the consumption of a good or service. A possible example could be your neighbor’s flower garden. She probably cultivates the plants solely for her own pleasure, yet you can still enjoy the beauty of the flowers whenever you walk by. Again, this can be illustrated by comparing social cost and social benefit. 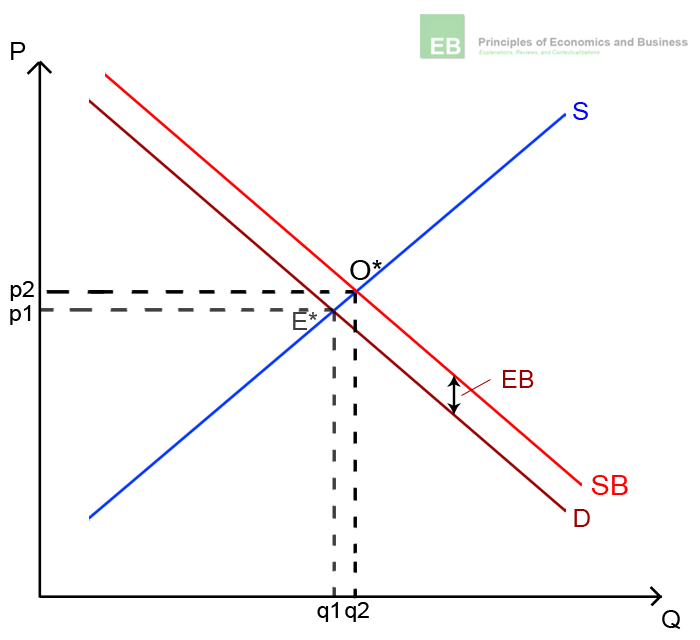 In this case however, the individual demand curve (D) lies below the social benefit curve (SB) because the external benefit (the beauty of the flowers to others) is not included in the neighbor’s demand curve. The social cost (SC) on the other hand is equal to the individual supply (S) because there are no externalities on the production side. Like in the first illustration, the market equilibrium (E*) is different from the optimal market situation (O*). As a result, there is an under supply of flowers. 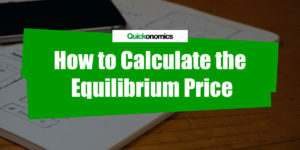 Unlike in the previous example, this time the optimal price (p2) is higher than the equilibrium price (p1). Generally speaking, the overall benefit of positive externalities to society is higher than the one that is taken into account by the actors in their decision-making. This results in an under supply of beneficial goods or services for society. 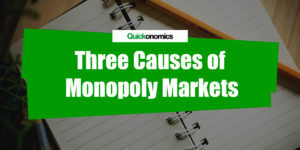 In order to correct these market failures it is important to know whether the externality arises from the production or the consumption side, since this affects the desired optimal market equilibrium. Negative externalities are defined as economic activities that have negative effects on unrelated third parties. They can be divided further into negative production and negative consumption externalities. Negative production externalities are negative effects that originate during the production process of a good or service. The most common example of this kind of externality is the pollution caused by firms during the production of their goods. Pollution affects the entire population, however as long as companies are not held accountable for it, they have no incentive to reduce their economic impact (because that would be more expensive). To illustrate this, we shall compare social cost and social benefit again. 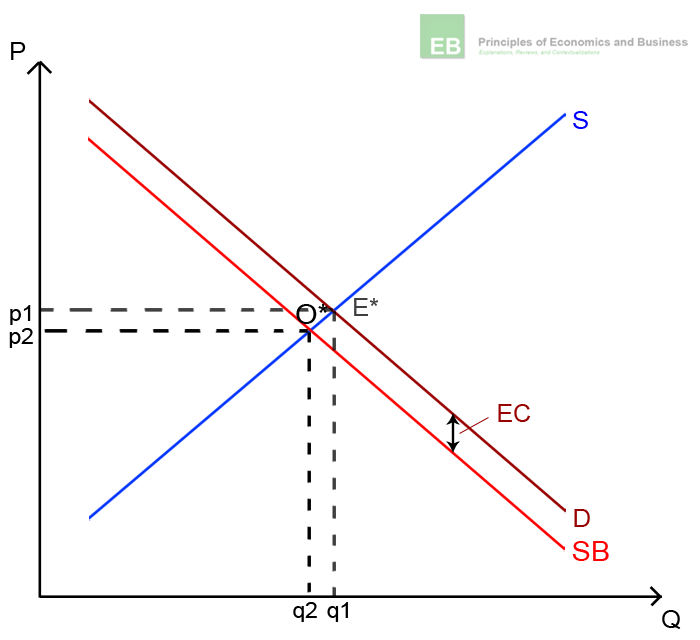 Similar to the positive externality example, individual demand (D) represents social benefit (SB). 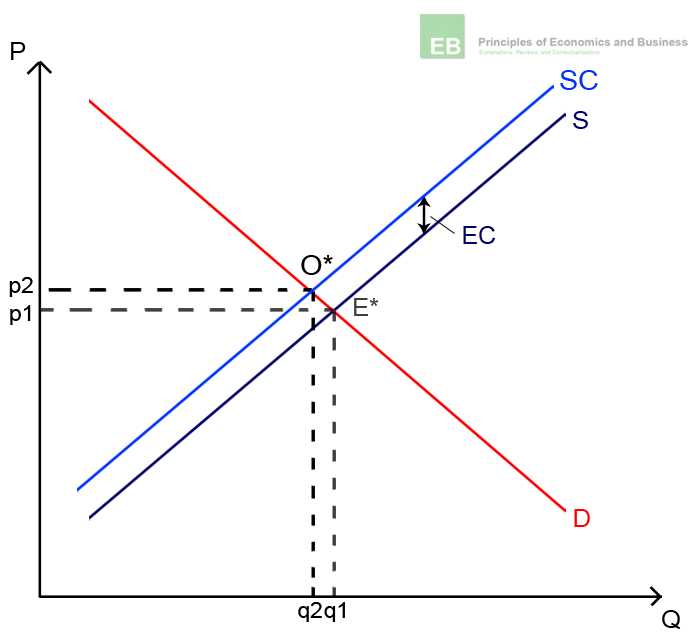 The social cost curve (SC) in this case however is higher than the individual supply curve (S) because of the external cost (EC) that is not included in the firms supply decision. As a result, the market equilibrium (E*) is different from the optimal market situation (O*) and there is an oversupply of harmful behavior. In this example, the optimal price of the good (p2) is higher than its actual market price (p1). Negative consumption externalities are negative effects that arise during the consumption of a good or service. To give an example, we can revisit your neighbor. If she likes to play loud music in the middle of the night, a negative externality on your part could be sleep deprivation. Once again, she may not take this into account as the consequences do not directly affect her. In this case, the individual demand curve (D) lies above the social benefit curve (SB) because of the external cost (your sleep deprivation) that is not included in the neighbor’s demand curve. The social cost curve (SC) on the other hand is equal to individual supply (S), because there are no externalities on the production side. Again, the market equilibrium (E*) is different from the optimal market situation (O*) and as a result there is an oversupply of loud music. In this example the optimal price of the good (p2) is lower than its actual market price (p1). Without any regulatory influence, neither the firm nor your neighbor will take the negative effects of their activities into account. 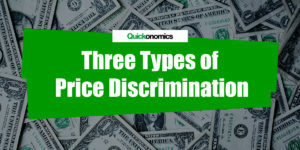 They are not directly affected by the consequences and will thus produce more than the socially efficient amount (see also The Coase Theorem). This results in an excess supply of harmful behavior. Externalities are the positive or negative consequences of economic activities on unrelated third parties. They can arise on the production or on the consumption side. In most cases, externalities result in a market failure that can only be avoided by imposing some kind of regulation to internalize them. Very helpful article for my Econ final! thank you! Brilliant explanations that are easy to understand. Keep up the good work. thank you so much, easy to understand. very superb notes which are not much complicated, maintain this standard, thank you. Nice. Thank you for the great service. Thanks for sharing. Very clear and easy to understand!